You probably know Behn’s Oroonoko better than I do. I’m reading/teaching (or that teaching/reading?) it for the first time. All that Love could say in such Cases, being ended, and all the intermitting Irresolutions being adjusted, the lovely, young and ador’d Victim lays herself down before the Sacrificer; while he, with a Hand resolved, and a Heart-breaking within, gave the fatal Stroke, first cutting her Throat, and then severing her yet smiling Face from that delicate Body, pregnant as it was with the Fruits of tenderest Love. 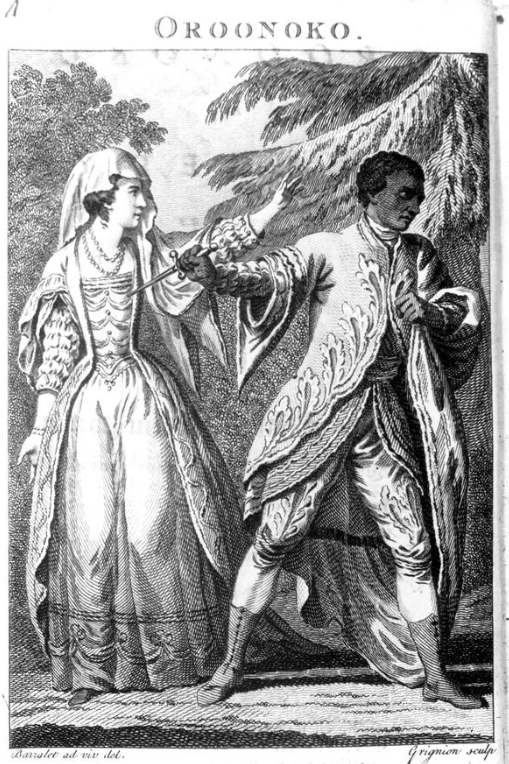 This is Oroonoko, the enslaved prince, killing Imoinda, his wife, to keep her from being “ravish’d by every Brute; expos’d first to their nasty Lusts, and then a shameful Death” after he revenges himself against the whites who wronged him. Behn, as I argued yesterday, faces an unsolvable problem: she has to have Oroonoko kill the pregnant Imoinda, and she has to have him do it out of love. She loads up the sentence with tender words — “lovely, young and ador’d,” “smiling,” “delicate,” and of course “tenderest” — and gives us an Oroonoko who is “adjusting” his “intermitting irresolutions” before he kills her. This is the act of a man of grace and honor, with none of the loathing, hatred, and bare desperation of Othello. As I told the class, while I thought Othello the greater work, and its emotions more frightening, I though Behn had done Shakespeare one better, on one key account, by politicizing the uxoricide: this is no private matter. This is political, a blow against the slavers, a call for abolition or, especially, a call by the Tory Behn to respect the rights of royals (for Oroonoko is, first of all, a prince). And yet: “severing her yet smiling Face.” What is he doing here? The students were as horrified as I was: was he actually carving Imoinda’s face from her head? Unlikely, I suggested; I think he cut her throat and then, perhaps to bring death fast, beheaded her. Behn can’t bring herself to say “beheaded,” though: maybe she’s remembering England’s regicide (which happened when she was 8 or 9) or maybe it’s just too ugly an act. So she solves the problem by giving us an image that’s, actually, far, far worse. As I’ll suggest, this inadvertent “defacement” may be the truth of the matter: not just that Behn can’t find the right words to present the impossible: a husband killing his pregnant wife, but tenderly; and not just that she’s simultaneously preserved and destroyed as a person, dying as a tragic heroine but dying because she’s just a slave, just fungible, a body without a face of her own; but also that the murder really is an act compelled by the slavocracy of English Surinam. This act of horror is not his own. Sort of. He’s killing her to preserve his control over her body (his tender love vs. the nasty lusts) but he’s compelled to do this only because he’s bound to. Where is his agency here? Where is hers? Where is the face — the site of the human, of the individual — in all this? This entry was posted in Teaching and tagged Aphra Behn, oroooko, race by medievalkarl. Bookmark the permalink.